TUESDAY, 13 SEPTEMBER – Almost a thousand students joined in to celebrate Hari Raya Aidiladha held at the Student Residential College, Kolej E, recently. According to the Deputy Head of Kolej E, Mohd Hilmey Saili, the event was organised by Nur Eman Club and the Exco of Personal and Human Capital Development of the Student Welfare Committee (JAKMAS) of the college. 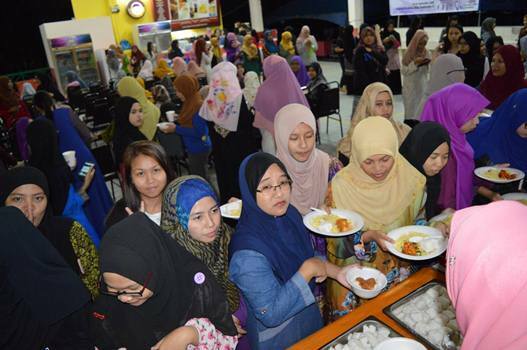 “Besides helping themselves to the various food prepared, the celebration also had Lafaz Takbir Raya, a video presentation and Raya songs sung by the students. “The event, which started from 8.00 am until 10.00 pm was also participated by students of Residential College Tun Mustapha and Residential College Tun Fuad,” he said in a statement today. Mohd. Hilmey said the programme aimed to celebrate the occasion among residents of Kolej E who were not able to return to their hometowns to celebrate Hari Raya Aidiladha with their respective families. “Programmes such as this would also be able to foster closer relationship amongst the college administrators and students especially those staying at Kolej E, UMS,” he further added.